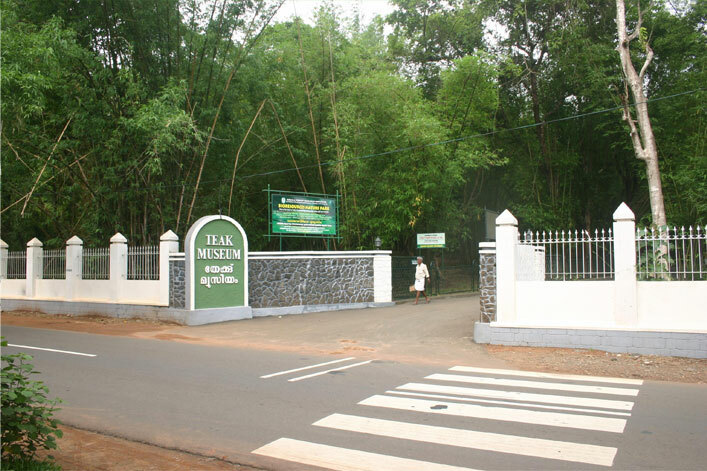 Teak Museum is situated in Malappuram district. This is the world’s first teak museum and was established in the year 1995. This is controlled by the Kerala Forest Research Institute. Information regarding the usage of teak wood and other articles is exhibited here. It is a two storied building set up on the campus of Kerala Forest Research Institute (KFRI). Lot of information about the teak tree attracts a huge crowd to this museum. The root of a 55 year old teak tree is kept in the compound that welcomes the tourists. The visitors will get to know about the activities that are carried out over 160 years in the field of teak plantation. Some of the exhibits here include the Kannimara teak which is the oldest teak found in Parambikulam wildlife sanctuary, life size structure of the trunk of the largest teak tree grown in Malayattoor forest division etc. Some other attractions include the traditional granary, model of the sailing vessel that is built of teak wood etc. Some other characteristics of teak can be understood in detail from the detailed description of the flowers, fruits and barks of the tree. There is also a base of a 480 years old teak tree that was found in the Nagarampara forest range of Kottayam. Besides all these the different stages involved in the rotation cycle of teak are also displayed here. A large collection of moths, butterflies and other insects that are found in the teak plantation are displayed here. There is also an exclusive section in which the disorders of the tree and the various diseases that the tree might get are explained. Some other attractions are the photographs of the teaks, traditional harvesting tools obtained from various parts of the world etc. The portraits of great personalities who have played a major role in the establishment of teak plantations and a library on teak are also kept here.